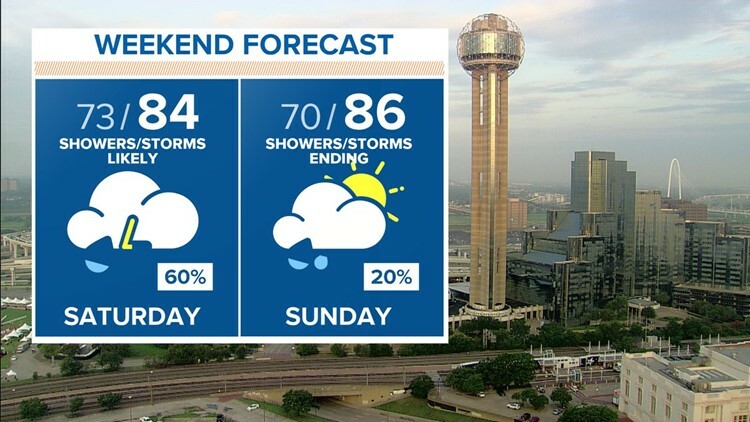 A Flash Flood Watch remains in effect through Saturday morning for part of North Texas. This does include Dallas and Tarrant counties! Click here to check WFAA local radars. Download the WFAA app with instant access to local radars across Texas and the latest forecast. Showers and storms are likely with locally heavy rain possible in some areas. Highs will only be in the low to mid-80s. Rain begins to taper off Saturday night and should end by early in the day on Sunday. Lows will dip to near 70° and highs climb into the mid-80s. Sunny skies return to begin next week!